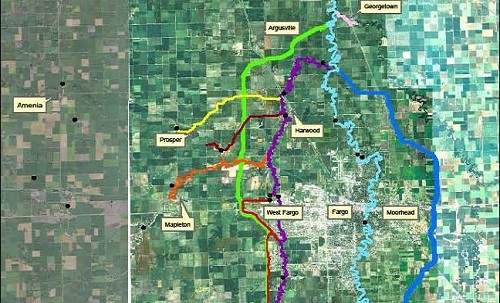 Geomorphology Study of Fargo, ND/Moorhead, MN Flood Risk Management Project (ND, MN) | WEST Consultants, Inc.
WEST Consultants conducted a geomorphic study of approximately 366 river miles to assist in the evaluation of flood management alternatives for the Red River of the North. WEST’s role was to determine the impacts of physical modifications to the channel and floodplain, including the proposed use of diversion channels, on the geomorphic processes of the river. The River Measurement division of WEST Consultants assisted with collection of discharge measurements, velocity distributions, and sediment samples using specialized field equipment transported to the project site. This equipment included a Sontek M9 Acoustic Doppler Current Profiler (ADCP) with RTK, USGS Type AA and Pygmy current meters, AquaCalc 5000 data logging devices, and various boats and accessories. The study documented and evaluated existing erosion conditions along the study reaches and predicted the magnitude of potential changes in the erosion and sedimentation conditions as a result of the proposed diversion alternatives. The study area included the Red River of the North (200 miles), the Sheyenne River (87 miles), the Wild Rice River (43 miles) the Rush River (9 miles) the Lower Rush River (7 miles), the Maple River (13 miles), the Buffalo River (3 miles), and Wolverton Creek (4 miles).